Did you miss me? I had a busy week, last week. We had to move mother in law from her house to her new condo, and it was a bit of a process. That house was the last place where she and father in law were together, and this move was emotional for her. She is a strong lady but some time, love, hand holding, listening... You know. Last week was also a bit tough on my husband, for obvious reasons so I just set other things aside and concentrated on them and being available. Sometimes, you just need to do that. I was happy to do it but I'm glad to be back doing my thing, again. I'm behind! I have a lot of catching up and a lot of work to do. 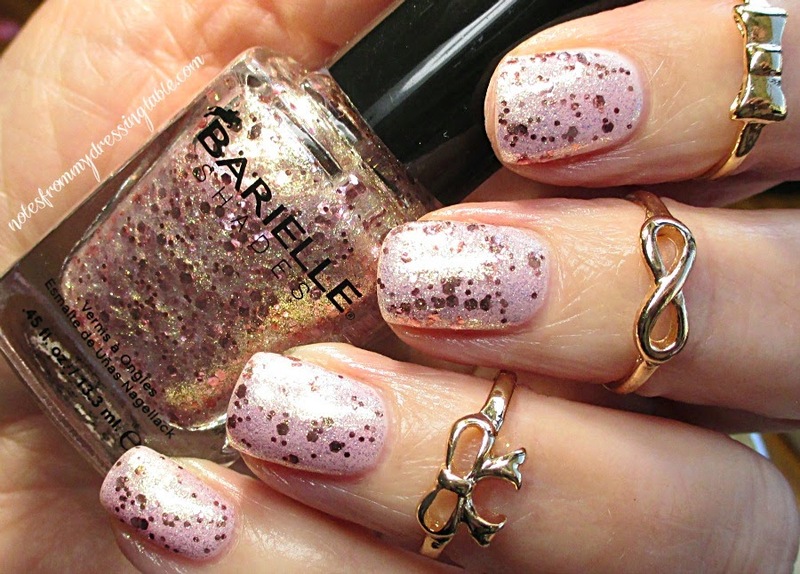 Barielle brings us a new ten piece glitter collection for Spring/Summer 2015. I have five of the polishes to share with you, today. My half of the collection is comprised of mostly shimmer-glitter polishes, a hybrid of shimmer and glitter that can be worn as a topper or built up to be worn alone. Now, if you ask me, shimmer-glitters of this type perform and look their best as toppers. Applying one coat allows their ethereal, delicate quality to shine and that is how I decided to feature them. All swatches are shown over base coat and topped with Seche Vite. Shooting Star over a rich lavender creme. After messing with this on a nail wheel over various base shades, I just went googly for this combo. Shooting Star is a blue to fuchsia (which my camera did not capture but is there, in person!) shifty glass fleck shimmer and small and medium highly reflective blue hex glitter pieces in clear base. Angel Dust. This iridescent glitter mix combined with a fine glass fleck that shifts from gold to blue is featured over pastel pink and blue just for the fun of it. Is this not the sweetest combo? I wish that you could see this in person! Sea Urchin. Layered over a teal crelly, this green shifting blue fleck with a wild purple flash and blue and gold glitters is under-the-sea-mermaid-magic! Amethyst. 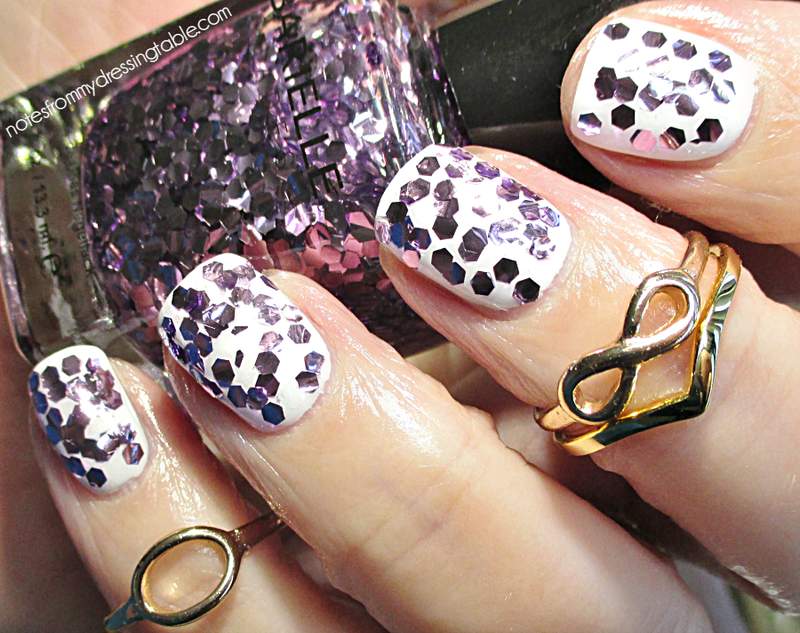 A thick, clear base swimming with large, shiny, purple hex glitter pieces. This glitter can be patted and squished on, as you see here or you can put out a little pool and pick up individual sequins to enhance or even form the main components of nail art designs. Versatile! And pretty. This one is popping over a white creme. Golden Halo. This beauty is, in my not so humble opinion the star of this little show. This. Polish. Is. Stunning! This gold fleck shimmer and rose gold glitter mix gracefully enhances any polish I choose. I am showing it over a red creme and a pink crelly. 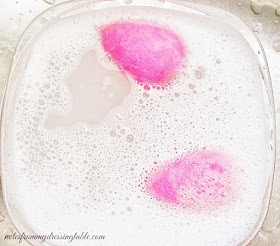 I featured the pink look in this post. It's still one of my favorite nail looks, this year so far. 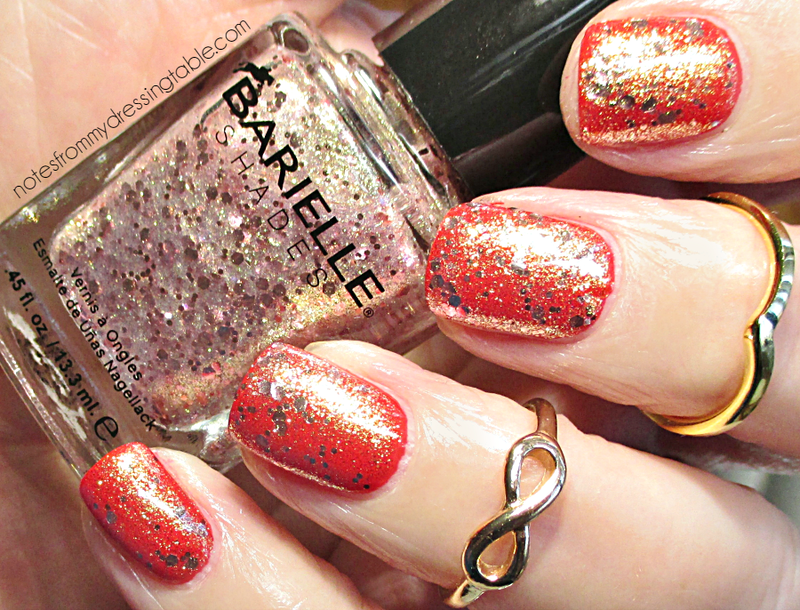 The Barielle Bling it On Collection is a good one! These polishes are just the loveliest toppers I have met in a while. Yes, these polishes can be built up to be opaque but when I played with them on a nail wheel to see how many coats it would take and the final result, I wasn't happy. The polish, when built to full opacity looked thick, gloppy, frosty, streaky and just... No. Smoothed in thin coats over coordinating creme/crelly base colours, they are pure magic! They apply beautifully, Amethyst, the hex sequin glitter does require patting into place, no shocker, there. I don't have to use a ton of top coat to smooth and get them shiny, they dry in good time when they get a good, fast dry top coat, like Seche Vite and wear time is damned decent. 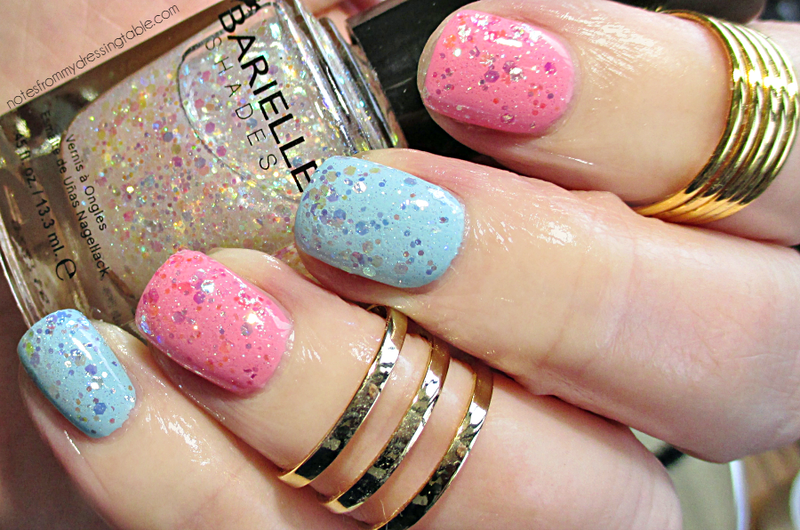 What do you think of these pretty polishes? See any that you think you have to have? The Barielle Bling it On Collection is $8.00 each and available on the Barielle website, in stores and salons that carry Barielle. Visit Barielle on Facebok, follow them on Twitter and Instagram. Oooh, I love all the glitters with the little flecks. Such pretty combos. I'm quite impressed with all the Barielle polishes I've seen. Amethyst isn't as much my speed, but the other glitters are gorgeous. I love glass fleck, and iridescent glitters a lot, and these all look great. Love the combos you chose. Shooting Star is definitely my favorite! First - I'm glad your MIL had you guys to support her, I can't imagine how tough that was for her!! Second - these are pretty. I like Angel Dust and Shooting Star! Moves are hard in so many ways... your MIL is so lucky to have family that loves and cares for her! My fave of the polishes is totally Shooting Star! She got through it really well, she just needed some love and surrounding. :) Shooting Star is so pretty! The shift in the shimmer has to be seen by your own eyeballs. Thank you. She is settled in her new place and happier for it, now. Which is good. Angel Dust and Shooting Star are both beautiful! Amethyst isn't my fave, either, I'm not big on the huge sequin glitters like that unless I use them as accents for other looks. The iridescent glitters tho are out of this world pretty! Thank you. I tried to match the toppers with good bases. Thank you so much. 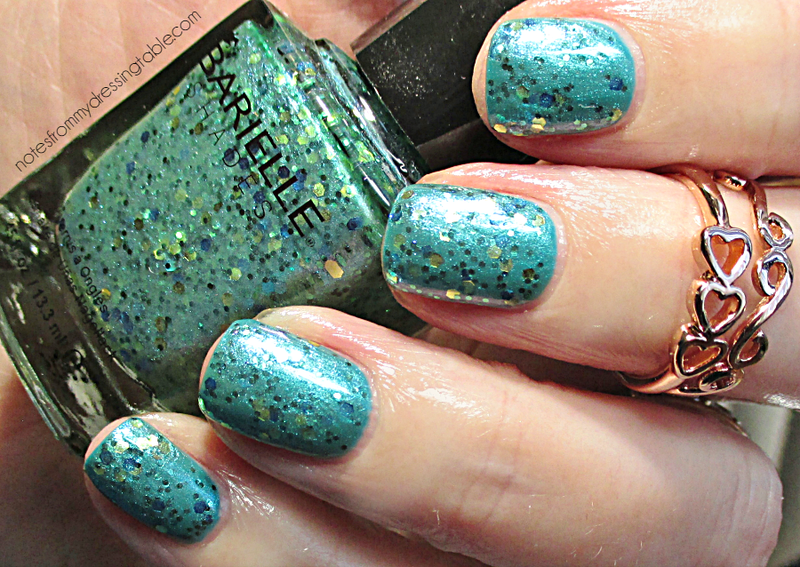 Barielle makes very good polish! Their formula is top notch. These are pretty. My favorites are Angel Dust and Golden Halo. My favorite is Angel Dust for sure but they are all pretty! They named this collection properly. So blingy and fun. Perfect name for this. So blingy!! Gorgeous swatches!! These shades are so pretty! Thank you. They are lovely, aren't they? I love the sparkle and shine. Thank you, Kath. 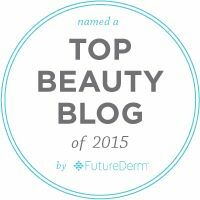 <3 Good picks, I'm not surprised that Sea Urchin is your fave! They did a good job on this one, didn't they? It's so delicately pretty, isn't it? I love it over pastel polish. Loving this collection on you- so pretty! Thank you. They are great polishes. Yes, it is! I think it would be great for rm or bridesmaids, too.